So many things have been happening in my life that I apologize to those of you that I was not able to visit last week. This week will be better. I have three children who graduated from college on Friday. It was a mad rush to try and make sure each felt our love. We had to divide to attend all three graduations. They did not all attend the same college. Then on Saturday we had a wedding open house for another daughter. It was a fabulous week for family and everything went beautifully. I love that we are now able to revisit the blind string, it does force ones thoughts into a different direction. It was so much fun and relaxing. Thank you Laura! Chewie has named "Earth Day", "Amanda Day". I love the idea of a name for this great and beautiful world we live on. In celebration of the earth and the need to preserve her beauty we give her a day in the year to reflect on how much we appreciate the miracle of her presence in the universe. I find that the colors of nature draw me in like no other beauty can. I use to say my favorite colors were green and blue because in nature the shades of those two colors is so diverse and rich. I have come to love all colors because I now know that they are all presented in all their glory on this planet we call earth. She does have a spirit and I hope we do not make her groan in sorrow by the way we live. I hope you all enjoy the challenge this week! 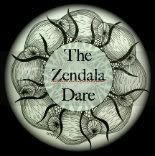 Zendala Dare #54 had a totally different shape and I found it intriguing to work with. The top is the way it really looks... the bottom one I played with my editing program! Weekly Challenge #114: "You with the Stars in your Eyes - Stars v 2.0"
Hummmmm.....now how to accomplish the challenge? Well this is the first effort. I took it pretty literally, I will play around a bit more today and see what else I can come up with. We woke up to snow...ahhh no stars in the sky this morning. We live out from town about 12 miles and are up in the mountainous west....over 1 mile high, and the stars are amazing. Without any other lights to distract the view, my nephew is a star gazer and he loves to come and sleep out on the trampoline, gazing at the stars for hours. Happy star week! It is amazing that for 53 weeks Erin has come up with fabulous templates for the dare. Congratulations Erin and also to all who participate in the dares. It has been and is a great amount of fun! I was sorry to see that Laura was struggling with technology yesterday. There is nothing more frustrating for me than when my computer is not working correctly....I become obsessed until I can fix the problem. When she posted yesterday I was in a rush to support my daughter who was being recognized as the art sterling scholar in our high school, so I put off tangling until this morning. The challenge, hip to be square, oh, squares are hard on me....but they are so beautiful when they come from the hands of others. I took inspiration from their ability to square out and I am pretty happy with the result. The first one is black and white with a hint of yellow light from the overhead light. The second is of course the same ZIA with a touch of color and framing. I hope you all enjoy being square this week! Conference gives me so much joy and tangling keeps me alert and awake! Erin issued a double dare as is her custom in the first week of the month. She does not appear to like circles but the template had a lot of circle type shapes going on. She wanted us to use Hollibaugh to change up the circle. Her tile was amazing, I struggled but this is what I came up with. In case you ask...where is the Hollibaugh...it is there just different than any I've seen before, I wonder if you can find it? Happy tangling! Weekly Challenge #112: UMT v. XV "Tuxedo"
UMT Challenge this morning. I drew up this pattern so long ago I almost forgot that it existed. Laura, thank you for making me use it again. I actually had to print out the steps because I had forgotten. I must say here that it isn't an intricate pattern, I was really only looking for something to feel a space. I started filling it with lines and this is what came to mind. My friend Carolyn named it. She felt that it looked like little men in Tuxedos I used it in a my first zendala.